The MRU Experience Lab is a creative space for students, faculty, staff and community to explore and experience virtual reality (VR), mixed reality (MR), and augmented reality (AR). The Experience Lab serves as a research and testing ground for faculty and students interested in exploring the educational potential of existing VR experiences, or in developing and assessing their own interactive VR content. Virtual Reality (VR) places the user in a computer-generated virtual environment that can be interacted with by a user wearing VR equipment including headsets, controllers, and sensors. Augmented Reality (AR) takes the users view of the real world and superimposes digital information and/or data on top of it. 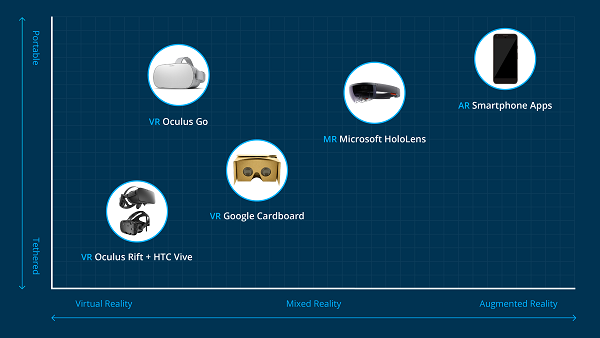 Mixed Reality (MR)combines aspects of both VR and AR, it lets the user see the real world (like AR) while also seeing virtual objects (like VR). It then anchors those virtual objects to a point in real space, making it possible for the user to interact with them. 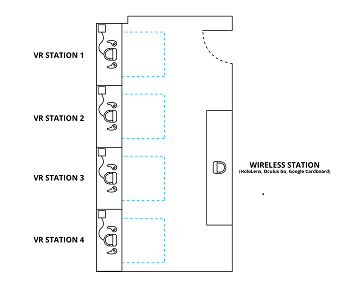 The Experience Lab can accommodate a maximum of 6 users at a time. The Experience Lab and equipment can be booked for classwork, workshops and research purposes. This space is not available for booking, drop-in hours for Spring are Monday, Wednesday and Friday from 11:00 AM – 2:00 PM. Before dropping in, please read the “First Visit” section. Drop in times are subject to change, please see the Library Programming Calendar. Each workstation may be used for a maximum of 60 minutes. 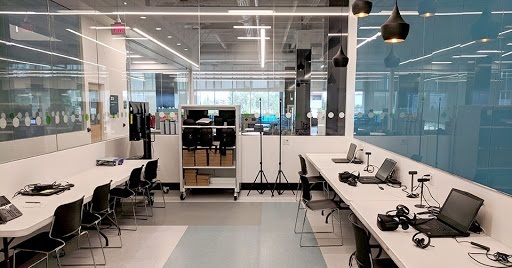 Explore Virtual Reality (VR), Augmented Reality (AR), and Mixed Reality (MR) and learn about the MRU Library Experience Lab (EL1355), available library services, headsets, 360 cameras, types of content and how to integrate it into your classes and research. Learn how to create 3D sculptures in Virtual Reality utilizing the Oculus Rift headset and Oculus Medium application, and how you can 3D print your model in the Maker Studio! *This item is available to sign out at the Library Service Desk. Please call 403.440.6019 to reserve. **The Vuze 360 Cameras require photo editing using Humaneyes Software. This software can be found at the following computers in the RLLC. Please read our Health and Safety section before attending your first drop-in session. We recommend consulting a physician before using the virtual reality equipment if you are pregnant, elderly, have pre-existing binocular vision abnormalities or psychiatric disorders, or suffer from a heart condition or other serious medical condition. Anyone who has had a seizure, loss of awareness, or other symptoms linked to an epileptic condition should also consult a physician before using the virtual reality equipment. A comfortable virtual reality experience requires an unimpaired sense of motion and balance. Do not use the virtual reality equipment when you are tired, need sleep, are under the influence of alcohol or drugs, are hung-over, have digestive problems, are under emotional stress or anxiety, or when suffering from cold, flu, headaches, migraines, or earaches, as this can increase your susceptibility to adverse symptoms. Operation of virtual reality equipment under the influence of drugs or alcohol is strictly prohibited. Immediately cease use of the virtual reality equipment if you experience any of the following symptoms: seizures, loss of awareness, eye strain, eye or muscle twitching, involuntary movements, altered, blurred, or double vision or other visual abnormalities, dizziness, disorientation, impaired balance, impaired hand-eye coordination, excessive sweating, increased salivation, nausea, light-headedness, discomfort or pain in the head or eyes, drowsiness, fatigue, or any symptoms similar to motion sickness. Consult a physician if you have serious and/or persistent symptoms. The virtual reality equipment can emit radio waves that can affect the operation of nearby electronics, including cardiac pacemakers. If you have a pacemaker or other implanted medical device, do not use the virtual reality equipment without first consulting your physician or the manufacturer of your medical device. If you walk to the edge of the designated play area, a barrier will appear in the VR experience, telling you to not cross that point. It is possible to lose balance and fall over while wearing the VR headset, especially if you are prone to experiencing vertigo. If you start to feel dizzy, either sit down or remove the headset. Remember that objects you see in the virtual environment do not exist in the real world, so don't sit or stand on them or use them for support. Depending on the size of your glasses, they may fit inside the headset. If not, you will have to take them off.. If at any point you feel sick while in virtual reality, remove the headset and wait until you have fully recovered. Consult your doctor before using the product if you have: pre-existing serious medical conditions (such as a heart ailment), conditions that affect your ability to safely perform physical activities, psychiatric conditions (such as anxiety disorders or post-traumatic stress disorder), if you are pregnant or elderly, or if you previously have had a seizure, loss of awareness, or other symptom linked to an epileptic condition. Do you clean the headsets? Yes, we sanitize the headsets and controllers in between uses. What kinds of experiences are available for me to try? Can I run experiences that I own on my personal Steam/Oculus account? Yes! If you own or purchase experiences that we do not currently have, you may log into your personal account and install the experiences that you want to run. How can I create things for VR? VR experiences can be created using both the Unity and Unreal Engine game development platforms. Specific software development kits or developer licenses may be required, depending on the headset you are developing for. Are food and drink allowed in the lab? No, please leave ALL food and drink outside of the lab.